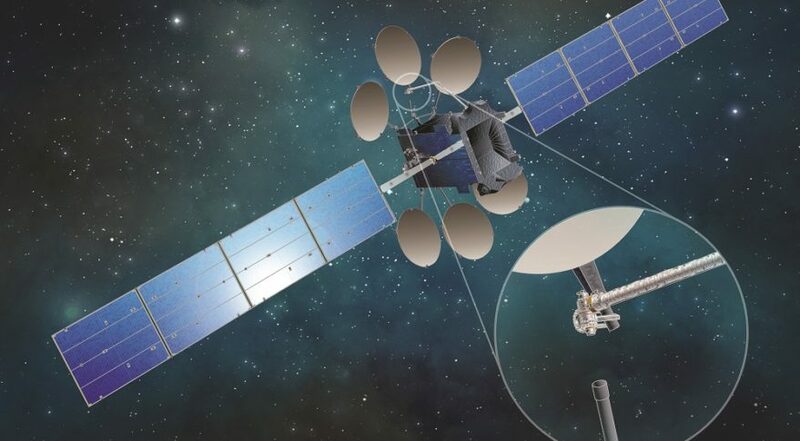 COLORADO SPRINGS — When Maxar Technologies stepped down as prime contractor for the U.S. government’s Robotic Servicing of Geosynchronous Satellites program in January, it also backed away from a commercial venture meant to turn satellite servicing into a business. A smaller program building a robotic arm for in-orbit satellite assembly could be Maxar’s next best bet to commercialize robotic capabilities in space. Speaking at the 35th Space Symposium here April 8, John Lymer, Maxar’s chief roboticist, said the company is committed to finishing Dragonfly, a NASA program to assemble spacecraft parts in orbit, enabling antennas and other systems to launch more compactly inside a rocket’s payload fairing. “Really what we’re trying to do here is produce a building block — the robotic building block — that we hope can change the way satellites do business in orbit,” he said. Maxar is building Dragonfly through a public-private partnership with NASA. Lymer said Maxar has invested more than $10 million on Dragonfly, an amount he described as “significantly less” than what RSGS required. Lymer’s presentation described Dragonfly as a 76-kilogram robotic arm that can reach out five meters from its base. 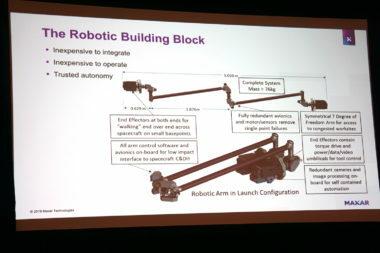 The robotic arm will have backups for all major systems, including avionics, motors and sensors to remove the risk of a single point of failure, according to the presentation. Lymer said a date for Dragonfly’s launch will be announced soon, possibly in the next month. Beyond the first launch, Maxar is preparing to pitch Dragonfly as a commercial technology it can build for both private satellite operators and government operators, Lymer said. Maxar’s goal, Lymer said, is to build Dragonfly robotic arms “where the recurring costs is in the low tens of millions” of dollars. As an example of a commercial utility, Lymer said Dragonfly could be used to attach signal reflectors on a communications satellite while in space (as opposed to having them attached and folded up prior to launch). Lymer said it takes a commercial satellite operator an average of seven years to pay off a satellite — a figure that includes launch and other costs. Satellite operators then make money on the remainder of the satellite’s 15 or more year lifespan, but uncertainty around new technologies, such as next-generation 5G communications, make that model less certain. Maxar is working on another satellite servicing project with NASA called Restore-L that is scheduled to launch in 2022 and demonstrate refueling of the 20-year-old Landsat-7 satellite. In contrast to the Defense Advanced Research Projects Agency’s RSGS, which was a public-private partnership, Restore-L is a NASA-led program that does not, at least at present, include a window for commercialization after its initial demonstration mission. Al Tadros, SSL’s vice president of space infrastructure and civil space, said Restore-L will have plenty of “residual capability” after completing its Landsat-7 demonstration, but if and how that will be used is up to NASA. Maxar announced April 8 that Restore-L’s spacecraft passed its critical design review, meaning it will be ready to ship to NASA next year for integration with its robotic payload.